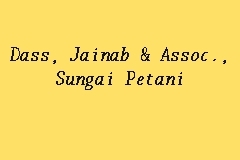 Dass, Jainab & Assoc. is a lawyer firm located in Sungai Petani, Kedah with 4 practicing lawyer. Here's the list of the lawyer: Nor Faizah Bt Mohd Saffar, Harikrishnan A/L Suppiah, Siti Aimuni Binti Abd Latif, Mira Nabilah Binti Mansor.